Its not about where u coming from but where u going, its not all about what u have but what u want to archive and its not a matter of how small or big your dream is but all about making it come true. Anything is possible in this small world only if u put your mind to it, always believe , think positive, be passionate, dream big and always keep good company. Life can be hard sometimes and u fill like u have the world on your shoulders just be patient,stay strong and never give up cause after every storm come a calm. There are a lot of things that take away our focus, determination, enthusiasm and attention from our dreams. We are facing a couple of problems as the youth of today, things like peer pressure, drug and alcohol abuse and teenage pregnancy which can lead to diseases like HIV/AIDS as well as STI’s. If the the Youth of today can say “No” to negative ideas and bad habits, this world would be a better place even for the next generation. Never let your head hang down always keep your head high. Never give up, loose hope and sit down and grieve. Stand up, keep going and never stop trying. Always stay true to yourself, talk from the heart and with your own voice. Working hard is the key to success, never take anything personally and if something blocks one route, find another. Don’t be discouraged by the failure, but rather learn from it. I believe that this is where you will find success. You must also have a clear vision of what you want to achieve. Never stop dreaming and never back down. 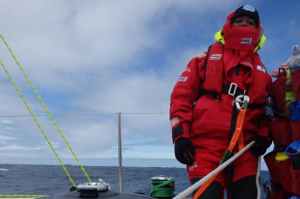 Mbongiseni recently was part of the Sapinda Rainbow team, this is a unique project which has taken young South Africans from across the country and trained them to race across the world’s most challenging oceans on the Clipper Race. ” I was doing one of the toughest leg in the race from South africa (CPT) to Australia (Albany) crossing the Southern Ocean. My journey was amazing it was a life changing experience and u get to see the beauty of nature. I enjoyed my journey of 26 nights no land even though sometime we faced bad,cold and wet weather for a couple of days in a row. Taking part in the race has changed me as a person,build my confidence and now anything is possible in my world nothing can stop me”.